Imagine that we are at a pitch session. 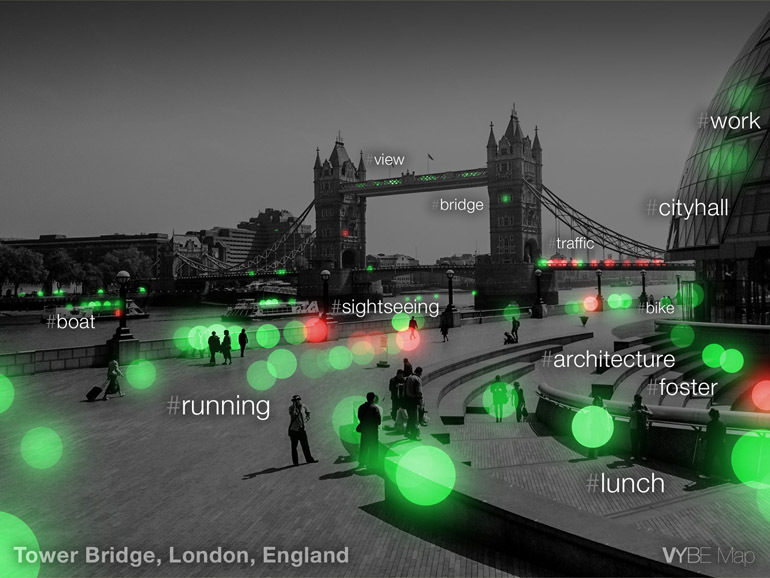 Get me interested in VYBE Map in 30 seconds. VYBE Map is a geosocial service which is now in beta testing stage for the mobile app. 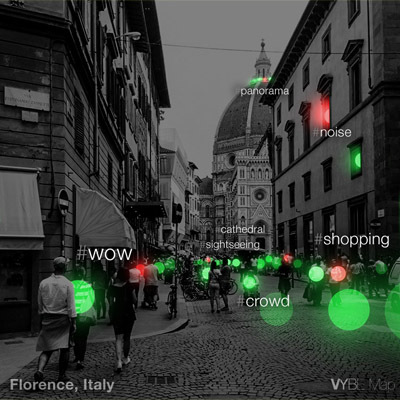 Our mission is to enable everyone to see the atmosphere, mood, aura of places that surround us in real time. You start your adventure with an app by tagging the so called VYBE. Your choice is simple: it’s cool – green VYBE, it’s lame – red one. You can also add hashtags. So let’s get into more detail. 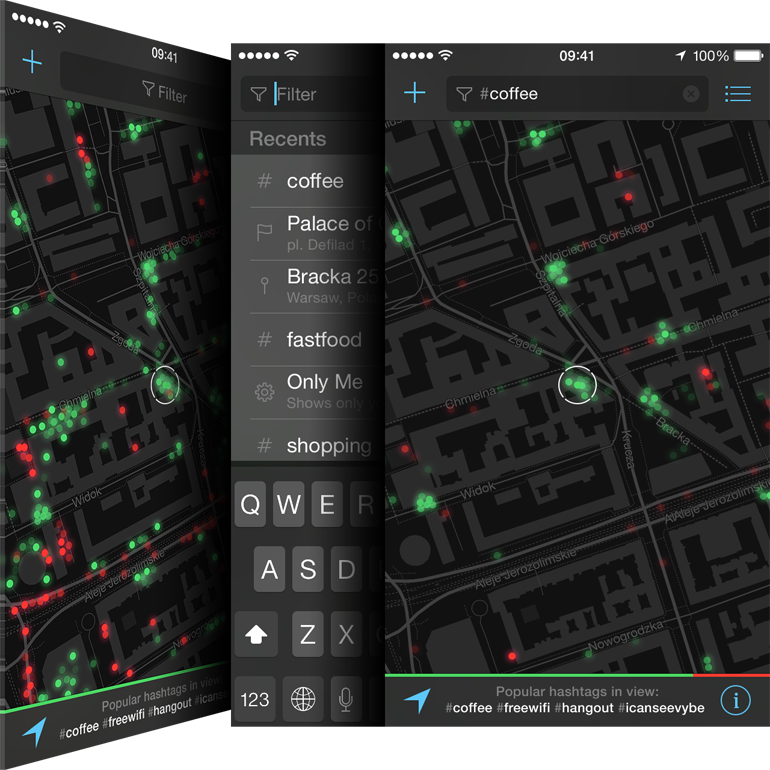 What is VYBE Map and where did the idea for creating this app come from? The route to VYBE Map was not that obvious and first ideas didn’t show that much potential. It started with the idea of communicating emotions – not only to people we know. What is characteristic of many emotions is that they are strictly related to places. This is exactly what the ‘vibe’ is. It’s close to us, we feel it and react to it, we share it and come back to it (willingly or not). But it’s not that easy to find, see and instantly share the vibe. 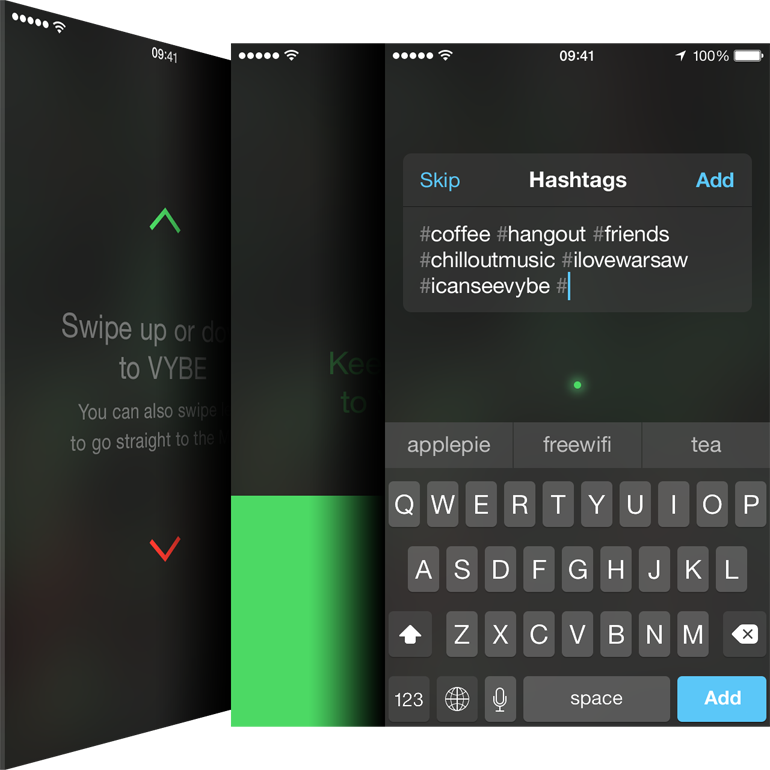 This is how the whole design process for the app started – to let everyone to measure and see the VYBE. It all boils down to two needs: expressing yourself and exploring the world around. To my mind, these two areas should gain a new, not very complicated experience that brings something to other people’s lives through transparency, simplicity and even the shortest interaction. Right from the start I’ve considered VYBE Map as a service and the product (app) is just something that makes it possible to deliver this service. Mobile app seems like a straightforward and easy way for delivering the service – this is why I think that it should be the first step, but definitely not the last. Right from the start I’ve considered VYBE Map as a service and the product (app) is just something that makes it possible to deliver this service. The app, as I already mentioned, was created on the basis of two needs: expressing yourself and exploring the world around. During the design stage it was crucial to think in the context of actions that the user will take, not about the app that will be used. 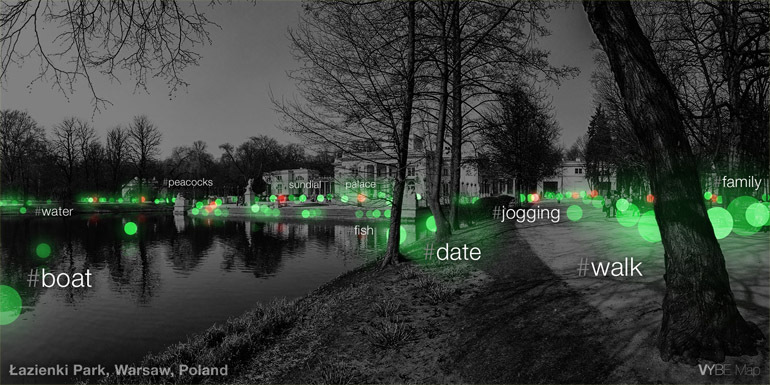 This is why the first screen – tagging a VYBE – is so important. It’s done with one gesture – swiping up (VYBE up) or swiping down (VYBE down). And that’s it – the user can stop his or her interaction with the app at this point. Adding hashtags is optional. If users decide to add hashtags they can use a system of hints so that the need to use the keyboard is minimised. Exploring the map should be pure pleasure. Filtering with hashtags would become an interesting experience, but the most important value here would be finding the place which is worth visiting. What will be helpful in this process are recommendations which are similar to music recommendations e.g. on Spotify. They are selected on the basis of our taste and the tastes of other users who are similar to us. One of the most important features of the site is anonymity – all data is fully anonymous and other users are not able to check the personality of a user who tagged each VYBE. What makes the map always up to date is the expiration date. New VYBEs are intense and bright at a map but they fade out in time to disappear completely after 7 days. A fun element to the app is gamification with the system of badges that everyone can gain e.g by VYBE’ing regularly or tagging in distant countries. None of the patterns mentioned above is something innovative in itself – the innovation lies in combining these patterns to create the new quality. You mentioned that one of the aspects of the app is anonymity. A question pops into my mind instantly – aren’t you afraid of buzz marketing? I can imagine the situation where a restaurant owner will add positive VYBEs about it with #lunch which can be used to destroy the competition VYBE Map can become a marketing tool instead of a lifestyle app. And the next thing – junk VYBEs. Do you plan to use some filter or will there be a rule of “Internet takes it all”? So let’s start with the “buzz”. Yes, it’s a real and big threat that I of course take into account. One of the first solutions to this problem that we’ve come up with was limited VYBE’ing in a given period of time and at a given area. But limitations shouldn’t be something that will become a part of the app. Cases like that will probably be dealt with the use of a VYBE “cleaning” algorithm. However, this will also be a challenge since the operating rule for the service should be its maximum transparency. And last but not least the solution that will be based on “learning” user’s preferences by the app. I don’t want to share too many details at that point but imagine that you’ll have access to the view with VYBES tagged only by users with similar taste, who see the VYBE in the similar way to you. I suspect that the creators of “buzz” will not be one of those users and as a result they will disappear from your map. If it comes to the junk VYBEs the same solution as the one described above could be used. At the same time without taking such measures we can learn a lot from services like Instagram and even Google who are facing the same challenge. Who’s working on the app? How many team members are involved? Up to now the most important parts of the project were: purifying the idea, drafting the strategy and of course the design and development part that led to creating the prototype that can be tested by everyone now. Most of those tasks were taken over by me if it comes to the design, graphical parts and the actual “coding” of the web app – prototype, which became one of the important milestones at this stage. Of course these are not the only duties related to this kind of project. This is why a friend who specialises in marketing is helping me. At the same time the support of my patient wife and helpful friends, recently also the numerous testers is invaluable to me. The team will be definitely getting into more formal shape, gain more specialisation and dynamics soon. Are you currently working on VYBE Map only or do you also have a full-time job while VYBE is an addition to it? Currently, VYBE Map is the thing that takes most of my time – which is even more than full-time This is strictly connected with launching the prototype and this stage definitely required such effort. But the beginning wasn’t so absorbing and I could easily share my time between VYBE and other projects. I think that I will be able to come back to these projects soon because they are on my mind all the time, but of course VYBE Map will remain the priority. The examples of other companies succeeding, struggling or not existing any more are a great lesson which should be learned by everyone who’s considering their business seriously. There are numerous ideas for new apps available at the market now. Some of them succeed, but some are just forgotten. What makes you certain that you will not end up in the second group? Well I’ve never had that certainty. I’m taking failure into account and I’m not afraid of using this term. The examples of other companies succeeding, struggling or not existing any more are a great lesson which should be learned by everyone who’s considering their business seriously. I still analyse these “black” scenarios and I think that VYBE Map has a chance to build great potential. It’s based on the widely known models used by largest websites. By looking at them closely we can easily identify which “patterns” are the most risky and how they can be prevented. I’m not claiming that VYBE Map will be immune to such threats, I just think it will be able to easily respond to the needs of the market. Is someone financing you? Are you looking for an investor or maybe you’re already in touch with some investors? Up to now the project was run using my own resources and what I mean here are mostly time spent for work, not the finance. The financing strategy is not fully shaped yet, but yes, first negotiations with potential investors have already taken place. VYBE Map is now at a highly risky stage of implementation, but the potential it has seems to convince investors. A strong argument in negotiations with business partners is without any doubt a working product – at least in its test phase. This is why the creation of the prototype was our priority now. Investors aren’t interested in ideas which were not tested or verified in practice at all. I hope that the results of testing together with activity and interest of users will help in finding the best business partner for the project. What are the largest issues during the embryonic stage of the project? What made you the most worried or stressed? I must admit with great satisfaction that working on your own idea is just pure pleasure. It was really demanding to work on my own on so many aspects of the project and sometimes it was just exhausting, but the vision of the final result was always enough motivation. Startups like this require hard work and maximum use of own resources. It happens that similar projects in time lose their pace of development, especially in small teams and this is a largest threat. Fortunately, the belief in the idea of VYBE Map has never slowed down, even for a while. The creation of a smartwatch version of the app shouldn’t take long as well. Smartwatches seem like the perfect device for VYBE’ing. When will you launch VYBE Map and for what devices? Testing is ongoing. Every week we give access to new groups of users so the “feeling” of the VYBE is at an arm’s length for almost everyone with a smartphone. What are your plans for the business model? How do you want to gain the first customers? Right now the most important goal for me is to deliver the best possible experience to users, make the use of VYBE Map a pleasure. Of course the ways to monetise the app are numerous and many of them were taken into account during the design stage. But currently I’m doing everything not to focus on that too much and just focus on creating a new value for users. The truth is that there is one main business model for VYBE Map with several variants to the model. Which one will be implemented depends mainly from the final choice of the investor for the project. Let’s imagine that the anticipated moment of the launch has come, what now? Advertising will be a big and difficult element at that point. It needs large expenditure and serious plans. The app itself would need to develop constantly, respond to the behaviour and needs of users, perfect the existing functionalities. Did you prepare for a scenario that the app doesn’t work and no one is using it? I hope I will not have a chance to see that A great advantage of VYBE Map is the fact that it can work very locally – even in one city, it doesn’t need to embrace whole United States or China. This is why it seems that the bar was not set too high. The app can be expanding in stages, in chosen locations with a high level of control. So let’s assume that VYBE Map is working, people use it every day. What are your plans for future development? Besides broadening the availability of VYBE Map to other devices there’s also an extended plan to introduce completely new features to the app. More ideas will definitely appear after the app is live so that we can respond to the needs of users and ensure even better user experience. All the actions will be taken with one main thought in mind: to let everyone see the VYBE. We also invite to visiting the project website www.vybemap.com. Architect by profession. 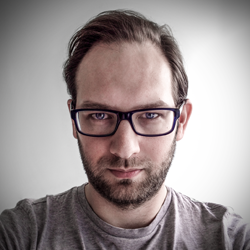 Having solid design background and being a certified project manager he has recently moved on to User Experience field which seems for him a natural extension of his expertise and passions. Currently working on his own projects and initiatives in different areas such as education, entertainment or social networking. At the moment his number one priority is VYBE Map – geosocial service that is about to let everyone see the real-time mood, atmosphere, ambience, or simply “vibe” of the real world.